* 본 제품은 기존 SMARTer® PicoPLEX® WGA Kit (Code R30050)의 업그레이드 버전 제품입니다. SMARTer® PicoPLEX® Single Cell WGA Kit는 단일세포 (single cell)로부터 높은 재현성과 정확도로 Genomic DNA를 증폭 가능한 제품이다. 본 제품의 기본이 되는 고유의 기술(특허 기술), SMARTer® PicoPLEX® 기술은 single copy genomic DNA의 증폭에 최적화되어 있으며 하나의 tube에서 반응하는 single tube reaction으로 사용하기 편리하고, 에러 및 백그라운드를 최소화하여 향상된 결과를 도출할 수 있다. 본 제품은 single cell (1 - 10 cells)뿐 아니라, 추출한 극소량(6 - 50 pg)의 gDNA로부터 Whole Genome Amplification (WGA)를 진행할 수 있으며, 증폭한 DNA는 PCR은 물론 array CGH analysis에도 적용할 수 있다. SMARTer® PicoPLEX® WGA Kit은 in vitro fertilization(IVF, 체외수정)시 pre-implantation genetic screening and diagnostics (PGS/PGD)와 같은 검사 시 유용하게 사용되고 있다. Flow-sorted cancer cells were amplified with SMARTer PicoPLEX single cell WGA technology. Each of the cells (blue lines) amplified at the same rate and resulted in a similar, predictable yield. A pooled sample of five cells (red line) represents a positive control. Samples containing 0 cells (green lines, no template control) show very low background. Single-blastomere biopsies were amplified using SMARTer PicoPLEX single cell WGA technology, labeled and hybridized to BlueGnome’s 24 Sure arrays at Genesis Genetics Institute. Note the clear indiciation of CNVs. In 2011 ESHRE clinical trials confirmed accuracy of karyotyping using PicoPLEX technology. 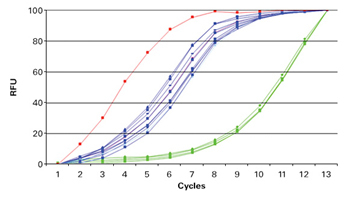 Locus-specific qPCR was used to quantify 48 loci in independent single-cell libraries. 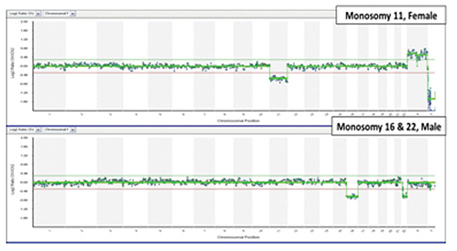 Data shown compares results of DNA from two individual samples amplified with (left to right) SMARTer PicoPLEX single cell WGA technology, GenomePLEX, and GehomiPhi using 10pg of DNA. More than 90% of the product from the SMARTer PicoPLEX single cell WGA technology produced identifiable, highly reproducible human sequences. 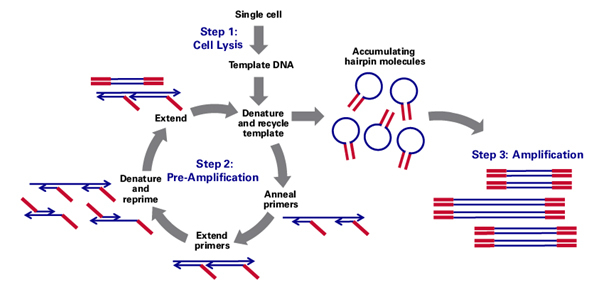 Whole genome amplification (WGA) from single cel..